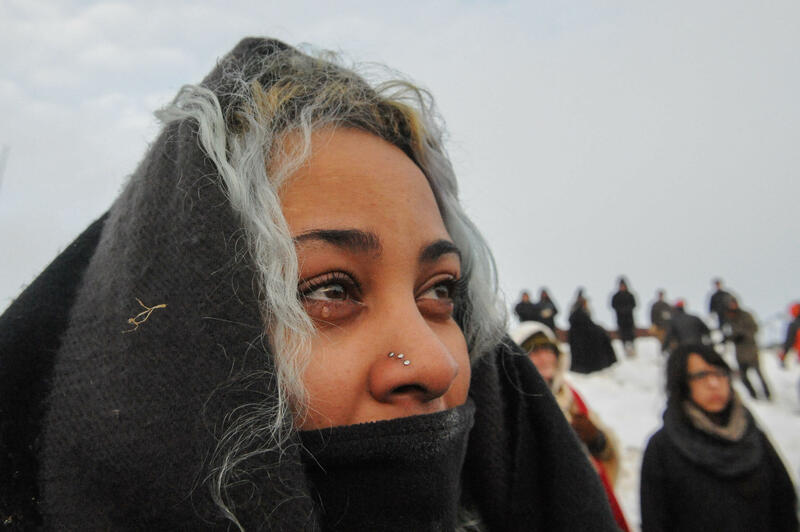 FARGO, N.D. -- The head of North Dakota’s emergency management services says the state is prepared to respond to Dakota Access pipeline protesters who may need help during a winter storm or some other crisis. State Homeland Security Director Greg Wilz said it would be a “huge challenge,” especially during a mass evacuation, but his office has winter shelter plans in place and various agencies are ready to respond. “The bottom line here is, if we are in a situation of life and limb, we are going to be humane in anything and everything we do,” Wilz said. The government has ordered hundreds of protesters to leave the Oceti Sakowin, or Seven Council Fires camp, on federal land in southern North Dakota by Monday, although demonstrators say they’re prepared to stay until changes are made to the route of the four-state, $3.8-billlion pipeline. The Standing Rock Sioux tribe and others say the pipeline north of the reservation could pollute drinking water and threatens sacred sites. The North Dakota Department of Transportation and Morton County Highway Department will be key players in any evacuation plans, Wilz said, noting that those agencies worked to keep roads clear around the protest site during a recent storm that dumped more than a foot of snow. U.S. Attorney General Loretta Lynch said in a statement Friday that the Department of Justice has offered community policing resources to local law enforcement as “winter begins to take hold.” ‘’Our first concern is the safety of everyone in the area - law enforcement officers, residents and protesters alike,” Lynch said. Morton County Sheriff Kyle Kirchmeier said Lynch contacted him by phone Friday to discuss the situation. The North Dakota National Guard is prepared to help with any emergencies, said Jeff Zent, spokesman for Gov. Jack Dalrymple. The Republican governor issued a “mandatory evacuation” Monday for the main encampment, though he said no one would be forcibly removed. Officers at the staging area and traffic control points have temporary warming houses, cold-weather gear and other winterization measures, said Rob Keller, spokesman for the Morton County Sheriff’s Department. “All law enforcement personnel who report for duty to the Morton County Sheriff’s Department are now from North Dakota agencies and they are more than prepared for our North Dakota winters,” Keller said. Wilz said his office has received no response from emergency management officials at Standing Rock about whether they have any emergency plans or whether they need support from the state.